What’s the best food for your puppy? How much and how often? All the breeds are so different, there’s no one-size-fits-all answer. Your puppy's condition is the best indicator of whether you’re feeding the correct amount. When the vet checks their weight, they’ll be able to confirm if your puppy’s growing at a healthy rate or whether you need to adjust their diet. A good puppy food will be specially balanced to meet your puppy’s energy, protein and mineral needs. It should be easy to digest to suit your puppy's immature stomach. So make sure you choose a food that's specially designed to suit puppies, rather than adult or senior dogs. And, of course, it must be tasty enough to enjoy. No. Too much phosphorus or calcium can cause deformities, so don’t use supplements except on your vet’s advice. Overfeeding will put too much stress on your puppy’s rapidly developing bones and joints and could result in permanent damage. 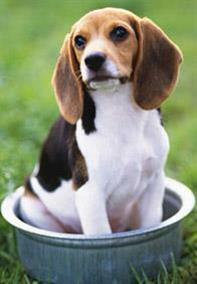 Make sure your puppy always has clean, fresh water available. If you notice that they’re thirsty all the time, consult your vet.